Heat oven to 250°F. In large skillet, brown ground beef and onion over medium heat for 8 to 10 minutes or until beef is thoroughly cooked, stirring frequently. Drain. Stir in chili powder, salt, garlic powder and tomato sauce. Reduce heat to low; cover and simmer 10 minutes. Meanwhile, place taco shells on ungreased cookie sheet. Heat at 250°F. for 5 minutes. To assemble tacos, layer beef mixture, cheese, lettuce and tomatoes in each taco shell. Serve with salsa; top with sour cream. These are very classic Mexican-American style tacos, the beauty of which is they’re completely customizable. Skip the ground beef and swap in ground chicken (which is really terrific with taco seasoning), use Old El Paso™ soft flour tortillas instead of the crunch taco shells, and bump up the toppings—set out bowls of chopped radish, sliced green onion, pickled jalapeños, and/or torn fresh cilantro leaves. Chili powder is a vibrant mix of dried oregano, garlic, cumin, and mild to hot chiles. Commercial blends can vary in flavor, but they all add that south-of-the-border taste to the meat. Choose a chipotle chili powder for more heat and a smoky undertone to the flavor it adds. Dinner will be ready in 25 minutes! 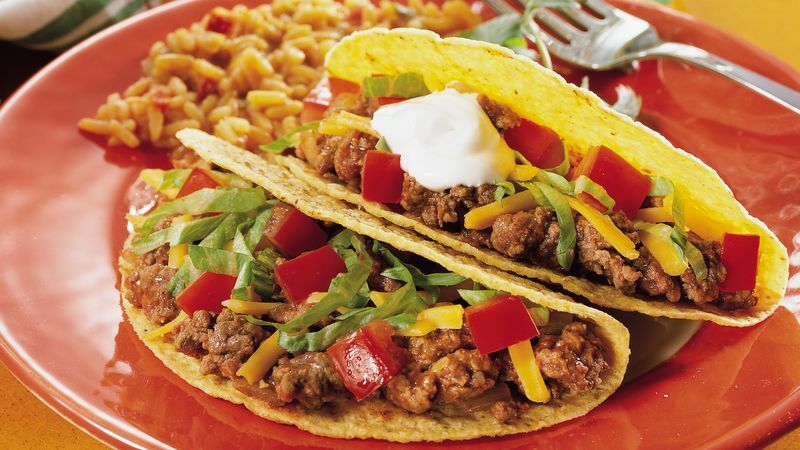 Enjoy this beef taco recipe that’s made using ground beef, cheese, lettuce and tomatoes. Add some flair with salsa, cilantro, chopped peppers and guacamole. Or switch things up a bit and make them with ground turkey or meat substitute. Serve these tacos with some freshly steamed vegetables and a side of white or brown rice, and you have a Taco Tuesday dinner that’s sure to be a hit with everyone. Now that you know how to make tacos, you can experiment with fillings that go beyond ground beef. Try tacos al pastor (made with seasoned pork steak strips), shrimp tacos, tacos filled with carne asada (seasoned flank steak) and more. So, once you’ve had your fill of ground beef tacos, try your hand at any one of these delicious takes on tacos.